Rick Perry at The Family Leadership Summit in Ames. Some of Donald Trump’s competitors for the Republican presidential nomination jumped to respond Trump’s remarks about John McCain this morning during an appearance at The Family Leadership Summit in Ames. 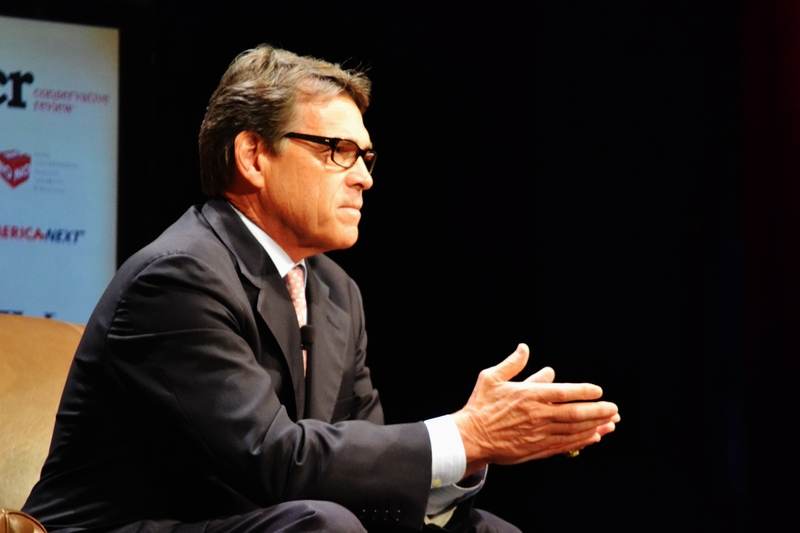 Former Texas Governor Rick Perry, a military veteran, said Trump needs to apologize. Perry said people like McCain have “sacrificed greatly” for this country and Trump, who got a medical deferment during the Vietnam era, has “disqualified himself” from serving as the country’s commander in chief. “If he cannot find it in himself to apologize to every veteran of this country, to every individual that has sacrificed and for the families of those young men and women who have died fighting for the freedom of this country, he does not have the character, the discipline or the resolve to be the president of the United States,” Perry told Radio Iowa. South Carolina Senator Lindsey Graham, who recently retired from the military, said it would be up to the voters of Iowa, New Hampshire and South Carolina to decide Trump’s political fate. “Here’s what I think they’re gonna say: Donald Trump, you’re fired,” Graham said, to cheers from the crowd. Wisconsin Governor Scott Walker used part of a stump speech in Sioux City to speak out. “I won’t say who, but somebody else raised a question about John McCain today. I’m not going to comment on his policies, but I just want to say something unequivocally: John McCain is an American hero,” Walker said. Later Walker told reporters he won’t comment on Trump’s policy statements, but felt compelled to comment after Trump’s “personal attack” on McCain. “Even though he was my opponent in 2008, there is no way that anyone can say anything other than this is one of the most honorable people who ever served our country, who sacrificed incredibly for our country,” Huckabee said. And Huckabee said no one should forget McCain turned down an offer of early release. Texas Senator Ted Cruz said during his appearance at today’s summit that he would “take the high road” with his GOP competitors and not “impugn anyone’s character” — but he did not speak directly to Trump’s comments. Aside from the comments about McCain, many the crowd were shocked when Trump said he’s never sought forgiveness from God. Judy Duvall of Urbandale said while voters are looking for a truth-teller, that was just as shocking as Trump’s remarks about McCain. Larry Murley of Aurora said while he was waiting in line for lunch that Trump’s “business bias” was on fully display this morning. Murley was “very much surprised” by Trump’s explanations about his personal faith, but he’s mystified by the McCain comments. “I’m bound to dismiss that a little bit as fumbling for something to say, I don’t know,” Murley said. Ray Dearden, a retired Iowa State University speech professor, said Trump’s “provacative” and “headline-stealing” comments remind him of Ross Perot, the 1992 third party presidential candidate. “I remember how he got 19 percent of the vote and I believe he threw the election to Bill Clinton,” Dearden said.